Description: MEMORIAL: Part 1! 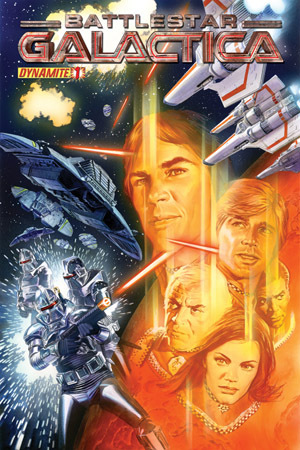 2013 marks the 35th anniversary of the original Battlestar Galactica TV series and to celebrate Dynamite is launching a brand new series, written by cosmic supremos, Dan Abnett & Andy Lanning (Legion, Nova, Guardians of the Galaxy)! Set in classic BSG continuity, this series celebrates 35 years of epic space opera when, following a surprise Cylon attack, Adama and the crew of the Galactica are forced to deploy Dr Zee’s experimental temporal weapons with unexpected results that leave Apollo and Starbuck lost in time and space in an alternate reality with no Galactica and no way of returning home! Description: The Earth may have dodged a bullet on 12/21/2012, but there are worse things in store for our little blue planet. Seven adventurers aboard the International Space Station watch in horror as most of the world is decimated by a monster solar flare. And their only choice is to return to the surface, and face whatever awaits them there! Description: The first chapter of the prequel comic to the new video game DmC: Devil May Cry! The comic reveals the unmissable backstory of the all-new Dante and his twin brother Vergil; with never-before-seen revelations on the iconic characters of the game! Also featuring chilling and resplendent art that goes beyond the confines of the game and into stratospherically blockbuster dimensions of hellish action and atmosphere. Description: DAMES. DINOSAURS. DANGER. Summer, 1943, and in the midst of a war waged by monsters, Staff Sergeant Tommy ‘Irish’ Flynn never expected to encounter a real one. But on a remote island in the South Pacific, Flynn and his squad come face-to-fanged-face with creatures long thought dead. Description: A double-size issue to kick off a new sci-fi series from Nathan Edmondson and newcomer Konstantin Novosadov. Haunted by recurring dreams, a boy named Winslow is hunted by mysterious beings and protected by an old traveler. Soon Winslow will realize that what is in his dreams is what the rest of the world has been made to forget–and what strange entities will stop at nothing to erase from his mind.